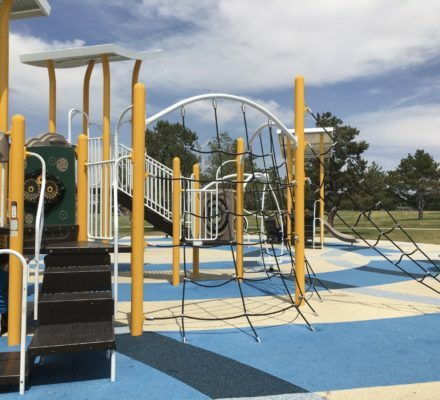 Del Mar Park – a tried and true local favorite for park goers! Del Mar Park has been one of my favorite spaces to play in Aurora for the past 2 years. 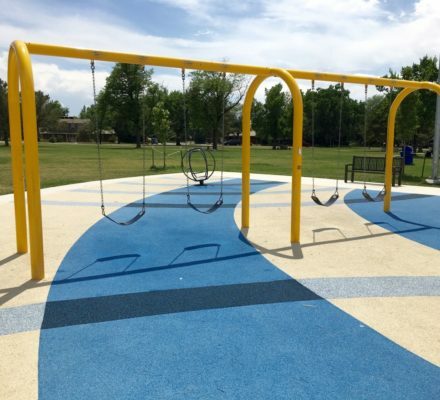 The recent playground and pool renovation at Del Mar Park turned out amazing! 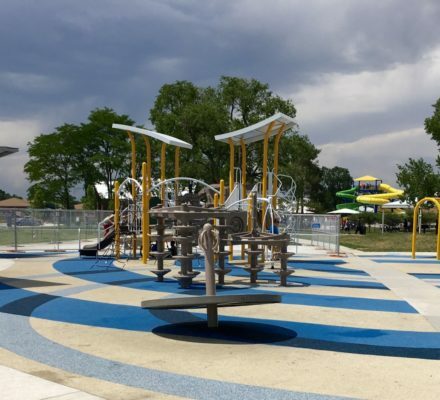 (more about the 8 million dollar revitalization project – with video) The awesome slides and various water features at the pool, along with the bright yellow playground will definitely catch your eye. 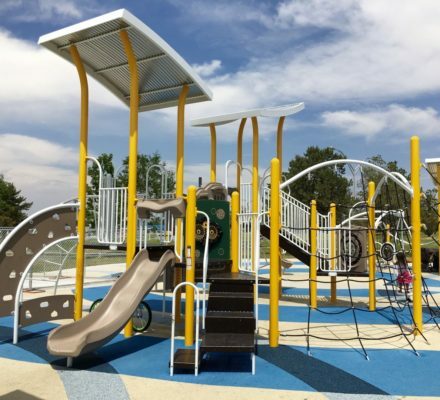 The playground specifically will keep your child or children active with modern nets, spinners, crazy climbers, slides, panels, and swings. Del Mar Park is also beneficial if you have children of multiple ages. 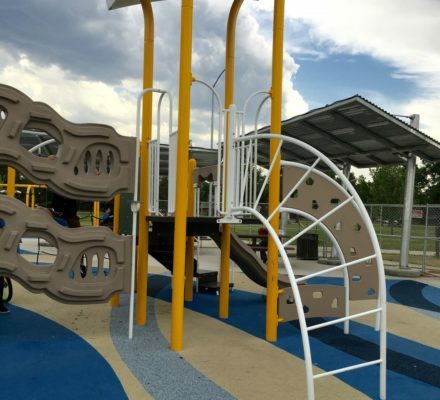 For example, at the playground area a smaller structure is precisely far enough to keep big and little kids separated, but close enough for you to properly keep all your children in sight. 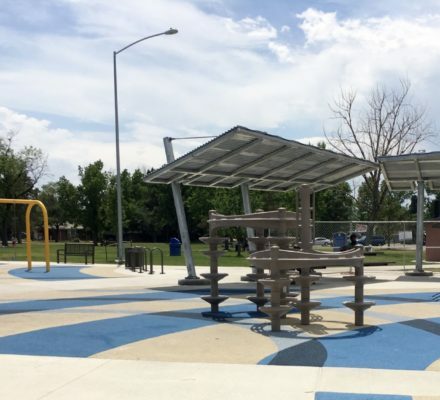 In addition, there is a nice metal canopy over the table/picnic area, where you can sit in the shade because this park gets hot! In regards to being hot, take precaution, as there are no direct trees to cover the playground. With that being said please be sure to bring water, sunglasses, and sunscreen if it’s a hot summer day. As for bringing extra amenities one thing you don’t need are soft shoes. 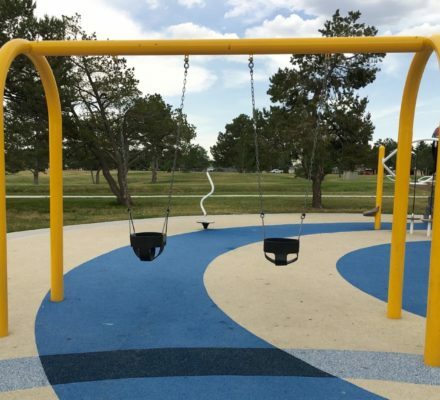 If you or your kids don’t mind playing and running around in flip-flops this park is for you. There are no bark chips that can get caught in your shoe because the surface is soft and safe. The sidewalk does split the two primary structures, but again they are surrounded by an incredibly nice soft surface. 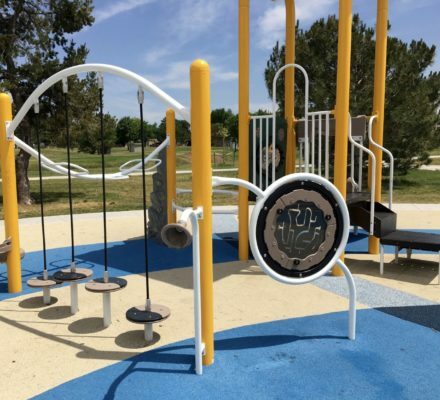 A unique characteristic about Del Mar Park is Burke’s freestanding Satellite Climber, which is in the center of the play area. For the longest time I couldn’t figure out the intention of this free standing structure, but when I went to Burke’s website I understood more. Although now I know it is a climbing structure, it still seems awkward and not many kids race to what could be a great pretend outer space. What kids do race to at Dell Mar Park are the unique spinners! The Energy Orbiter that tilts and somewhat reminds me of a merry-go-round is usually packed full of kids. In addition, the park has one of my favorite spinners, the Comet, which looks like a little globe, and is located behind the big kid swings. The unique Double Amped Link (Deck to Deck) climber in between the Rock and Roll slide and other climbers is an additional bonus to this fun playground. 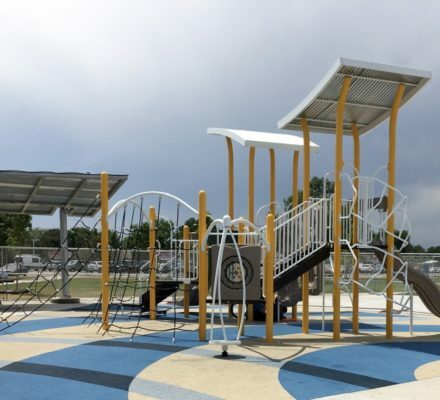 With all these extra additions, Del Mar Park creates curiosity and provides unique active play. 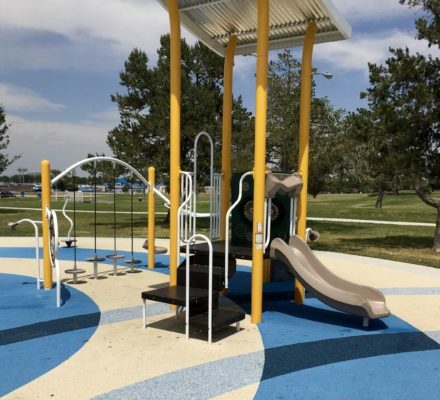 Last, but not least Del Mar Park offers additional and somewhat rare fun by providing sandpit volleyball, the amazing aquatic center, lighted tennis courts, 2 basketball courts, 2 football fields, baseball diamonds, and the Aurora Center for Active Adults. Del Mar Park truly has something for everyone. Check it out and continue to Love Colorado Living. About the author: Andrea is a seasoned park enthusiast who holds a great love for discovery unique fun each day. 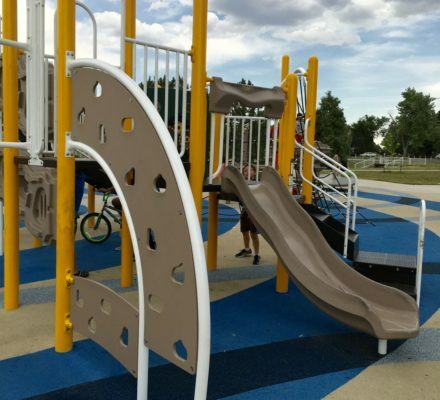 In 2016, along with her children, they will have played at over 200 separate playgrounds. 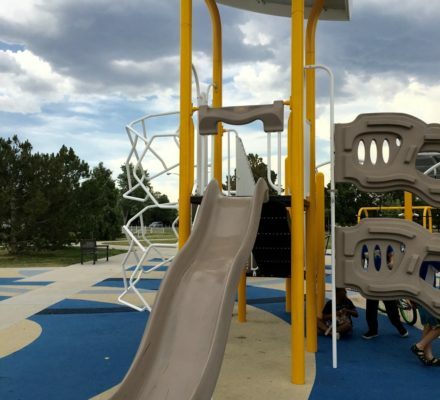 Playgrounds are the family’s getaway to celebrate and enjoy life.